For frequent Amazon patrons, the online retailer's Amazon Prime service is a pretty good deal. For $79 a year, customers get "free" two-day shipping, a so-so movie-streaming service (think Netflix Lite) and most recently an ebook rental service for users of Kindle devices. Even without the benefits of video-streaming and book rentals, Prime is a win-win for both Amazon and its most loyal customers. Frequent shoppers get fast and free (OK, discounted) shipping, which they've paid for upfront. And since Prime subscribers have a strong incentive to buy as much stuff from Amazon as possible, the retailer also benefits. If you haven't signed up for Amazon Prime before, now is the time to give it a test run. Amazon offers a one-month free trial membership, which is handy for holiday shoppers who are either too lazy--or too smart--to fight mall crowds, traffic gridlock, and Black Friday shootouts. Next step: Go to Amazon and shop away. Once you've bought and shipped all of your holiday presents (via free, two-day shipping that is truly free), simply cancel your Amazon Prime Membership before the one-month trial expires. Beware: If you pulled this trick last Xmas, you're out of luck. 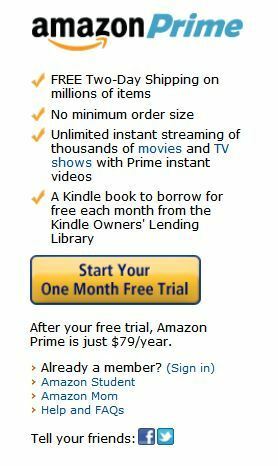 The free trial offer is open only to customers who haven't been Amazon Prime members in the past 13 months.